Unbelievable News for lovers of Reformation Theology who read the NKJV. By sheer providence, we have managed to get a hold of a large number of new copies of "The Reformation Study Bible" (NKJV) Bonded Leather Burgundy edition ISBN# 0785258566. Not only is edition this hard to find, we have the best price available ANYWHERE for this item (Only $49.95). Take advantage of the opportunity if you want a Reformation Study Bible in the New King Jemes Version. There is only a limited supply of these NKJV Bibles at this price. The Christ-honoring notes of this Bible are really the best of any Study Bible. The first Geneva Bible opened the pages of Scripture for all readers and provided helpful notes to assist in the understanding of its central message. 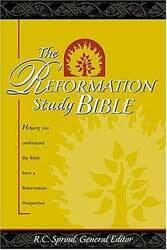 The Reformation Study Bible, under the editorial leadership of reformed scholars such as R.C. Sproul and J.I. Packer, offers a modern restatement of Reformation truth for the broad evangelical community. A wonderful resource for anyone who desires to understand the impact the powerful truths of the Reformation have had on today's church. Available in the New King James Version. If I may ask, are the words of Christ printed in red ink, in the Reformation NKJ? Indeed they are. The ESV version is black letter; the NKJV is red-letter. What size type is it available in -- i.e. 9pt, 10p5, 12pt, etc.? I have one right before me and cannot find what the font size is in the opening pages. Is there usually a specific place that it has this information? My guess from eyeing it would be 9-10.5 at most. The font is definitely not for those who are visually impaired but would be comfortable for the average reader. Unlike the ESV which has two columns on each page, this one has one column. It also has nice maps in the back and often maps on the pages themselves. Although both are good, it seems like more care went into the production of the NKJV. What are the chances of getting this Bible in black genuine leather? I would like one to preach from (I like the single column! ).